Getting to Aéroport Nice-Côte d’Azur (NCE) on the French Riviera is easy by bus, tram, train, helicopter, taxi, and airport shuttle vans. Aéroport Nice-Côte d’Azur (NCE) is very easy to reach by car, bus, tram, train, or helicopter from many other towns on the French Riviera and Monaco. Express buses run from the airport to Nice Gare SNCF train station, downtown Nice and the Promenade des Anglais, Moncaco, Menton, Cannes, Antibes, and Golf Juan. Regular buses are available to Nice, Grasse, St Martin Vesuble, Auron, Isola 2000, and Valberg. To other destinations, it is generally easiest to transfer to trains or use the huge number of bus connections available from central Nice. 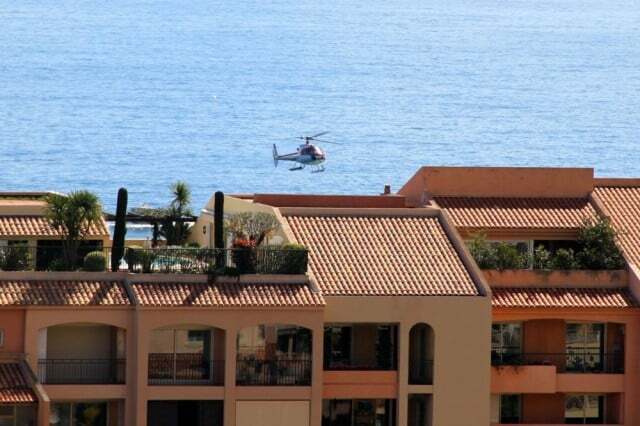 Helicopter transfers from the airport are a quick way to Monaco and Cannes. Taxis and airport shuttle vans are often worth the splurge especially at odd hours or when traveling as a small group or family with luggage. Taxi2Airport and Suntransfers give online quotations for private airport transfers without first requiring personal details or flight numbers. From mid-December 2018 tram 2 will start running from both airport terminals and during 2019 will become the best public transportation option to Nice-Côte d’Azur Airport. Nice-Côte d’Azur Aéroport (NCE) is the busiest French airport outside Paris. 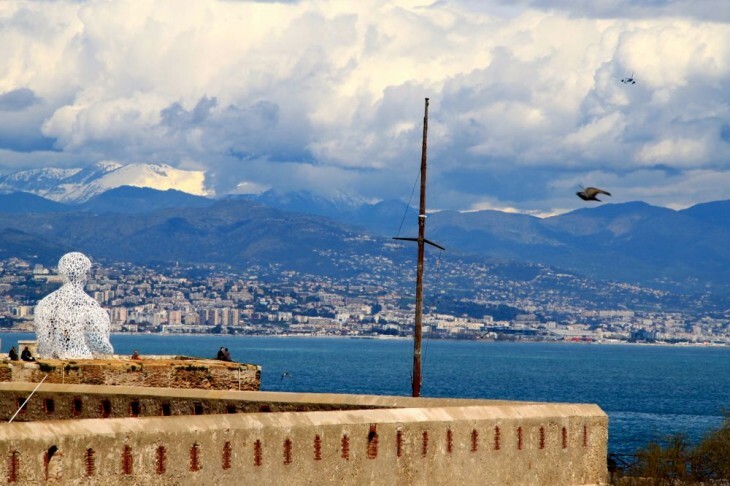 The airport is very conveniently located on the seafront just to the south of the city Nice allowing fast and easy access from many French Riviera towns – it is generally worth using the toll road highways to bypass Nice. Autoroute A8 exit 50 is right at the airport. For groups, families, and travelers with luggage, taking a taxi or pre-booked airport shuttle van service may be a good idea and not that expensive. Taxis are according to the meter (with surcharges allowed for luggage, Sundays, and night times (19:00 to 07:00)). Expect to pay around €30 to Nice Center (less to Promenade des Anglais), €50 to Antibes, Sophia-Antipolis, Beaulieu-sur-Mer, Villafranche, and €75 to Monaco or Cannes. Buses are currently the cheapest and best public transportation option to Nice-Côte d’Azur Airport but from mid-December 2018, trams will progressively become the easier option. Tram 2 will run from mid-December from Airport Terminal 2 and Airport Terminal 1 along Avenue de Californie (parallel to Promenade des Anglais and the seafront) to Magnan on the edge of Nice’s city center. During 2019, the line will extend to the downtown and the old town area and eventually all the way to the port. Tram 2 will become the best public transportation to Nice-Côte d’Azur Airport (NCE) with frequencies as high as every three minutes. In contrast to the airport express buses 98 and 99, the tram will have no airport surcharge and thus cost the standard fare (€1.50) with free transfers to further buses for 74 minutes. Travel between the two airport terminals is free. See By Tram to Nice-Côte d’Azur Airport for more details. Buses often provide the cheapest and best public transportation options to Nice-Côte d’Azur Airport (NCE). Special express airport buses (€6) stop less often but cost more while regular Ligne d’Azur buses cost the standard €1.50 to any destination in the Alpes-Maritime département. Many buses stop in the main road near Terminal 1 but only buses 98 and 99 stop directly at Terminal 1 and 2. Traveling on the tram between the terminals is free – walking is not recommended. Seat reservations are not possible on any of these public buses. 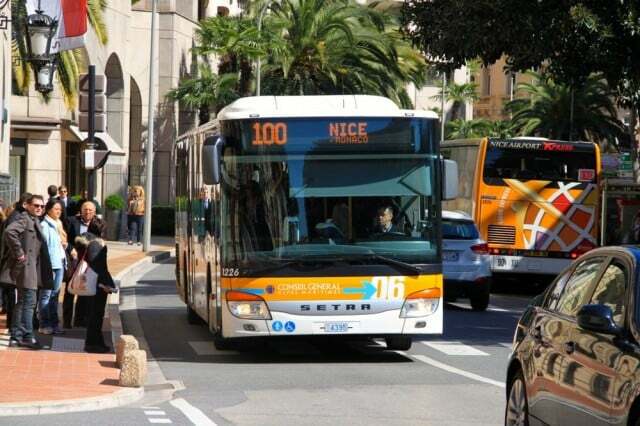 Travelers to Nice have two airport express bus options from the airport terminal to central Nice: Express buses 98 to Nice Gare SNCF train station and 99 to Nice Promenade des Arts (via Promenade des Anglais). Regular bus 23 no longer stop directly at Terminal 1 but in the main road in front of the airport – several other regular buses also stop here and are convenient when not traveling with luggage. The express buses are €6 (and ticket valid for 74 minutes of travel on connecting buses and trams) and the regular buses, e.g. bus 23 cost only €1.50. See Buses from Nice-Côte d’Azur Airport to Downtown for more details. Airport Express buses are also available from Nice-Côte d’Azur Airport (NCE) to Monaco and Menton (110), Cannes (210) and Antibes / Golf-Juan / Vallauris (250). These airport express buses cost significantly more than the €1.50 of regular buses but are much faster and generally do have more space for luggage. Regular Lignes d’Azur buses (€1.50 to anywhere in the region) that stops at the airport include services to Grasse (500), St Martin Vésubie (730), Auron (740), Isola 2000 (750 – summer only), and Valberg (770). At night, bus N100 (Monaco & Menton) and bus N200 (Antibes / Cannes) call at the airport. Daytime bus 200 (Antibes & Cannes) does not stop directly at the airport terminals. Further buses stop at Aéroport / Promenade on the main road outside the airport and are not considered official airport buses – it is a short walk from here to Terminal 1. Regular tickets (€1.50) and day passes for Nice (€6) can be bought from the driver or from the ticket windows at the airport. It is worth picking up a free bus map from the ticket office, where other passes (€15 for a week ticket for all of Nice) as well as train tickets may be purchased. On many buses, a first piece of hand luggage is free but a second piece may be charged €1 and a suitcase €5. Trains do not stop directly at Nice-Côte d’Azur Airport (NCE) but it is often the best to walk or take a bus to the station to continue journeys to many Riviera towns. Trains are faster, less crowded, and continue later at night than local buses. 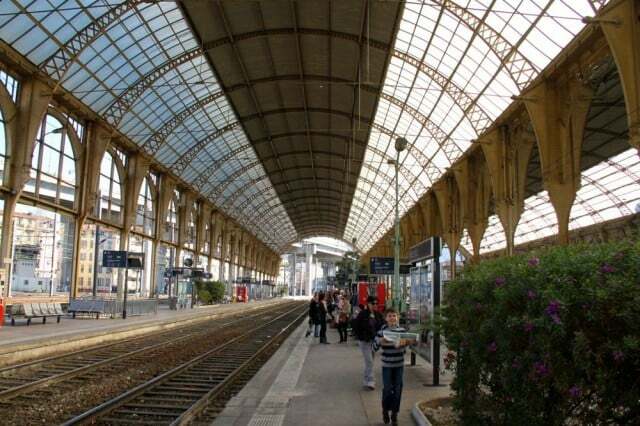 Gare SNCF Nice-Saint-Augustin is only 1.5 km from the airport and almost all local TER trains call here. It can be reached in a 10-minute walk from Terminal 1, or a block from Grand Arenas – the first tram stop outside the airport (€1.50 well spent) . The most recommended alternative is to take bus 99 to Nice Ville main train station and continue by rail from there. See By Train to Nice-Côte d’Azur Airport for more details. Helicopters provide fast and glamorous transportation from Nice-Côte d’Azur Airport (NCE) to top French Riviera destinations such as Cannes, Monaco and Saint Tropez. Flight times are around 7 minutes to Monaco or Cannes and expect to pay around €120 for a shared flight. Use RailEurope or Oui SNCF for French national railways timetables and tickets. Buying train ticket online is often easier at Trainline: from Nice-St Augustin or from Nice-Ville.